French Ambassador to Seoul, Philippe Thiebaud (2nd from left) poses for camera with officials of the French business schools at his residence in Seoul on Nov. 28, 2008. 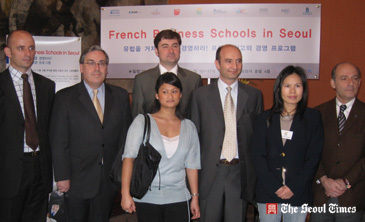 The French Embassy in Seoul and "CampusFrance Coree" will co-host the "French Business Schools in Seoul 2008" event at the Seoul Plaza Hotel in downtown Seoul on Nov. 29 and 30, 2008. A total of 10 French business schools will take part in this event, with thirteen official representatives participating. The names of the participating grandes ecoles are HEC, ESSEC, ESCP-EAP, EM Lyon, EDHEC, the CERAM Business School, Audencia Nantes, the ESC Rennes School of Business, and the Burgundy School of Business. The grandes ecoles, uniquely French educational institutions, were established in the early 19th century to prepare students for senior public administrative government positions. The grandes ecoles include Sciencs Po (Institut d'Etudes Politiques de Paris), Ecole Normale Superieure, a school of veterinary medicine, as well as business schools. The graduates of these schools receive a master's degree. Along with their long traditions and rich histories, the grandes ecoles provide top quality vocational education. In addition to their regular training programs, they offer students abroad the opportunity to study through international exchange programs. Admission selection for these schools is very strict due mainly to the volume of applicants. In recent years they have become increasingly open to applications from foreign students. For this year's event, the directors for admission from each of the 10 business schools (grandes ecoles) will be present. The open-house event takes place on Nov. 29 (Saturday), 2008, 10:20 a.m. - 9 p.m., and Nov. 30 (Sunday), 10 a.m. - 4 p.m. The schools have openings for master's degree courses in business administration for the year 2009. French Ambassador to Seoul, Philippe Thiebaud hosted a reception at his residence in Seoul between noon and 1:30 p.m. on Nov. 28, 2008. Some 60 people including officials of the French business schools were present. So far, more than 300 people have applied for these programs, according to sources of "CampusFrance Coree." For further details or inquiries, please contact the French Embassy in Seoul at 02-3149-4333 or the French Cultural Center in Seoul at 02-317-8567.